What could be more refreshing than the wintery wonderland outside? Why an ice bath, of course. Pictured is Saara Louhensalo. 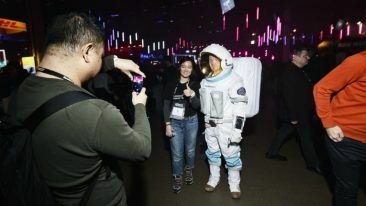 The buzz showed no sign of abating during the second helping of Slush, as funding, Formula 1 and the elements made an impression. 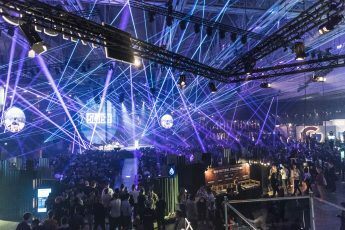 Outside, the lilting flurries of snow that greeted attendees at the entrance of Slush were a fitting opening curtain to kick off proceedings for day two. Inside the Exhibition Centre, however, things were heating up. Funding was the trending word of the day, with at least three big financing rounds announced. Walking away with the most significant fattening of wallets was Canatu, who followed up its 22-million-euro booty from last year to the tune of a further 12-million euros. 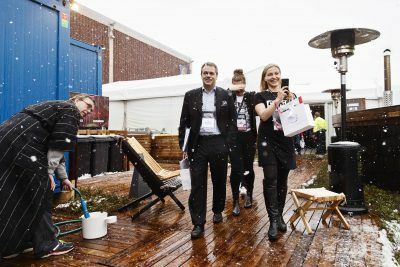 Helsinki mayor Jan Vapaavuori (in suit, left) and Slush CEO Marianne Vikkula brave the elements. Meanwhile, Finnish medtech company Fimmic closed a five-million-euro investment round to accelerate scaling of its WebMicroscope AI Cloud for tissue diagnostics. 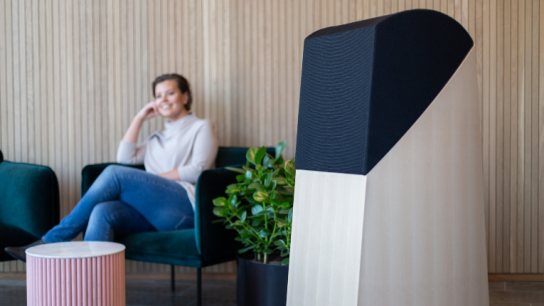 “Our AI algorithms have been successfully used in various applications ranging from cancer research to drug development projects on Parkinson’s disease and liver diseases,” said CEO Kaisa Helminen, in a press release. Finally, Artificial Intelligence (AI) tool Iris.ai announced it had closed a two-million-euro round. With founders from Finland, Norway, Bulgaria/Sweden and Spain, the company helps researchers in industry and academia to find relevant scientific knowledge by semi-automating the process. Mika Häkkinen shared his insights about dealing with pressure. Issues regarding AI were of a different kind over on the Founder Stage. The secretary of state for digital affairs for France, Mounir Mahjoubi, underlined a necessary development needed to grease the wheels for the development of AI. Elsewhere, the topics on offer had decidedly more diversity – typically eclectic. CEO of Blinkist Holger Seim underlined the importance of creating consumer subscriptions. “It’s more and more important to have members than subscribers,” he stated, “to create the notion of belonging. 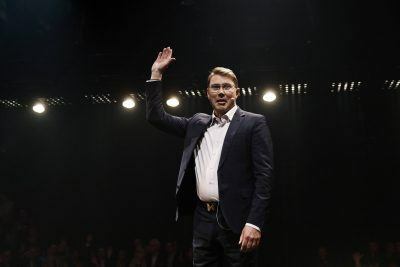 Finally, one of the most anticipated speakers, at least among the petrol heads in the audience, was Finnish Formula 1 great Mika Häkkinen, who took a trip down memory lane. Seven years later Häkkinen won his first Formula 1. 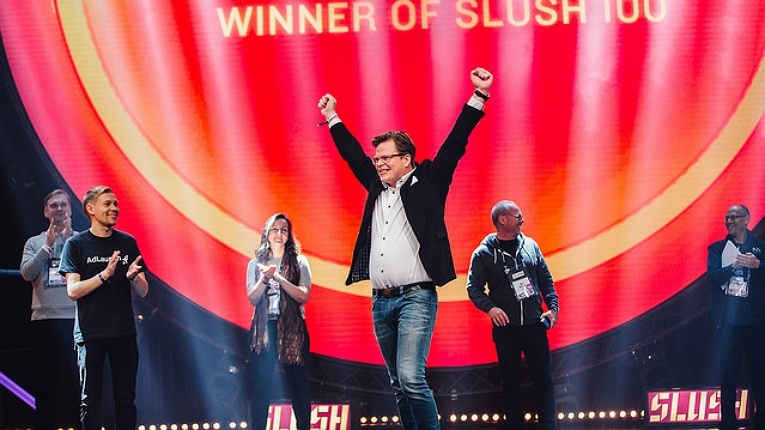 As for what will happen to Slush in seven years, the only way is… even further up. 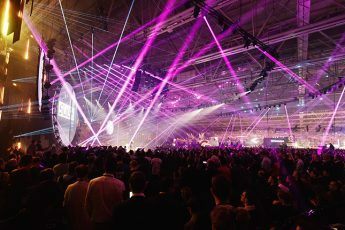 Altum Technologies won the Slush 100 Showcase for 2017, for its solution that cleans industrial equipment without having to shut down production.